Tackling The Nose in under two hours required extreme focus, coordination, and a whole lot of finger training. 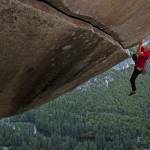 Tommy Caldwell and Alex Honnold’s speed ascent of The Nose still has our heads spinning. It turns out Honnold — a veritable real-world Spider-Man — put in serious training time over the winter and spring with Jonathan Siegrist. His goal: Crimp like a boss! Watch Honnold endure painstaking finger-strengthing exercises and some forearm-screaming ascents. And check out our interview with Honnold on what it took to capture The Nose speed record.